Uganda Police has confirmed the arrest of more than 80 suspects accused of pick pocketing, theft and misconduct at Bobi Wines’ Kyarenga concert which was held at One Love beach in Busabala on Saturday. The suspects reportedly detained at Kabalagala and Katwe police divisions were apprehended on accusations of engaging in offences such as pickpocketing, drug smoking, and fighting and being public nuisances. On 12th November 2018, the Kampala Metropolitan police spokesperson, Luke Owoyesigyire, told the media that the police force had arrested 80 suspected pick pocketers at the Kyarenga concert that happened at One Love Beach in Busabala last Saturday and the police is to screen the suspects whom will be presented to court to answer these cases. Owoyesigyire also applauded Bobi wine supporters and revelers for being peaceful and respecting the day’s security plan. Before Kyarenga concert, the police force together with the military had issued security guidelines for those attending the event which was estimated to attract more than 50,000 music lover and supporters of the Kyadondo East Member of Parliament, Robert Kyagulanyi Ssentamu. Unconfirmed reports indicate that 43 motorcycles and seven cars were impounded for abusing traffic regulations on Entebbe highway while going or returning from the Kyarenga concert. 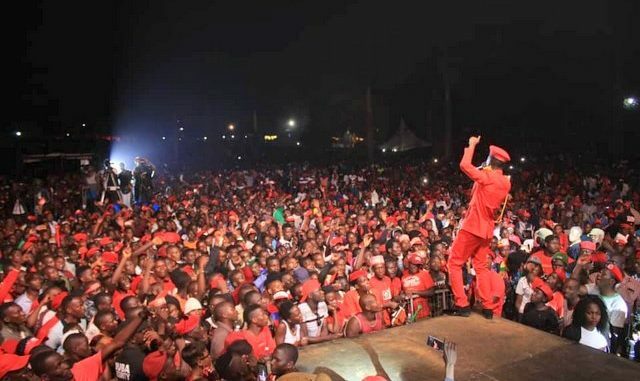 During the Kyarenga concert, Kyadondo East MP Bobi Wine who is eyeing the biggest office in the country urged the youth to prepare for the 2021 general elections in advance and to also obtain their national IDs in order to be in position to vote in 2021 general elections. Bobi Wine said the youth should register in time to get their national IDs which is a vital document that qualifies one as a voter. He said it would make no sense for youth to cheer up politicians at the fore front of political change when they are not eligible voters.